December usually brings a dearth of smartphones to fawn over. Most companies want your attention and wallets focused on what already exists, but that doesn't mean the rumor mills are completely silent. A new batch of speculation from @upleaks details unconfirmed specs of HTC's upcoming flagship. That's a lot of "woah if true" for just one tweet. Earlier (and equally unconfirmed) rumors said that the M9, now supposedly codenamed "Hima," would actually scale up to a 5.5-inch QHD screen. 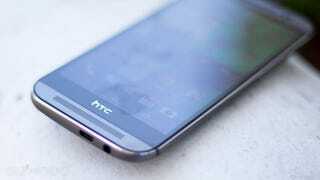 But @upleaks suggests that HTC will be sticking with the One M8's 5-inch design along with a 1920x1080 display. That's still 441 ppi, which is just fine by me. However, the rumored Hima will get a pretty big processor bump by reportedly including Qualcomm's newest top-of-the-line processor, the Snapdragon 810. With the March date mentioned above, the timing would certainly be right for the new HTC flagship to include Qualcomm's latest as Snapdragon 810 mobile development units went up for sale last week. Another point of interest is HTC's (still rumored) decision to ditch the UltraPixel tech that's been a proprietary camera feature on the company's flagship devices since 2013's M7. Instead, "Hima" might go with a beefy 20.7-megapixel shooter with a 13-megapixel front-facing option, recently seen on HTC's Desire Eye smartphone, or perhaps stick the 4 UltraPixel camera on the front. The UltraPixel tech is actually pretty decent in low-light, and would be a good option for a no-flash environment. With an expected update to HTC's Sense UI to be expected, the only other standout leak is the 2840 mAh battery. If the rumors are true, it definitely falls short of devices like the Droid Turbo, but running a Full HD LCD panel won't munch on battery life as much as an QHD panel would. Some say that "Hima" will be replacing the "M9" branding completely, but the moniker could also be the device's internal codename rather than the official word we'll see displayed on ads and packaging come this spring.